Redmi Note 6 Pro will go on sale for the first time in India today, with sales starting at 12pm IST via Flipkart, Mi.com, and Mi Home stores, in the company’s Black Friday Sale. The company has also revealed that the newly launched smartphone will ‘soon’ be made available via Mi Preferred Partner stores and Mi Stores across the country. The Redmi Note 6 Pro is the successor to the popular Redmi Note 5 Pro, and packs a few upgrades over it, though several specifications remain the same. The Redmi Note 6 Pro price in India was revealed at its launch event on Thursday. The Xiaomi Redmi Note 6 Pro₹ 12,999 price in India starts at Rs. 13,999 for the 4GB RAM/ 64GB inbuilt storage variant, and goes up to Rs. 15,999 for the 6GB RAM/ 64GB inbuilt storage variant. However, on its first day of sales, called the Black Friday Sale by the company, the smartphone will have a Rs. 1,000 discount, bringing its price down to Rs. 12,999 and Rs. 14,999 for the two variants, correspondingly. Also on the Black Friday Sale, HDFC Bank is offering a Rs. 500 instant discount for Xiaomi Redmi Note 6 Pro buyers using its credit/ debit cards or opting for an EMI transaction. Other launch offers include Rs. 2,400 Jio Cashback on customers opting for a Rs. 299 plan (giving them 24 Rs. 100 vouchers). Jio subscribers will also have the option to get double data benefits on 4 recharges of Rs. 198 and plans, on device activation until June 2019. Overall, Jio is offering up to 6TB of data. Finally, the company will also be bundling an ultra-slim case in the box. 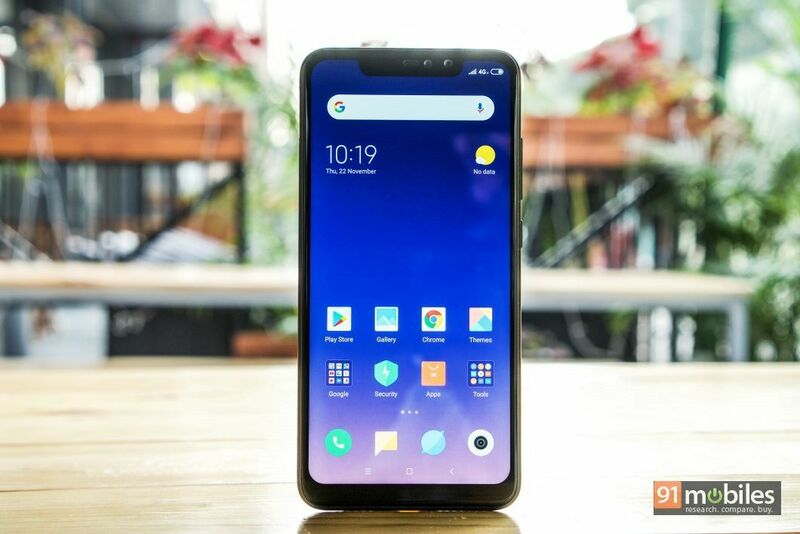 The dual-SIM (Nano), dual-4G VoLTE Xiaomi Redmi Note 6 Pro runs MIUI 10 on top of Android 8.1 Oreo, and sports a 6.26-inch full-HD+ (1080×2280 pixels) IPS LCD panel with a 19:9 aspect ratio, 2.5D curved glass, Corning Gorilla Glass protection, and a maximum brightness of 500 nits. The handset is powered by an octa-core Qualcomm Snapdragon 636 SoC, coupled with an Adreno 509 GPU, 4GB/ 6GB of LPDDR4x RAM, and 64GB of onboard storage. Storage is expandable via microSD card (up to 256GB), though you will lose access to one of the SIM cards. In terms of optics, the Xiaomi Redmi Note 6 Pro bears a vertically aligned dual rear camera setup with a 12-megapixel primary sensor – coupled with f/1.9 aperture and 1.4-micron pixel size – and a 5-megapixel depth sensing secondary sensor. The company is touting the presence of Dual Pixel Autofocus, EIS, AI scene detection, AI Portrait 2.0 (with Dynamic Bokeh, Light Trails, and Studio Lighting). On the front, the Xiaomi Redmi Note 6 Pro sports yet another dual camera setup. There is a 20-megapixel primary sensor (with 1.8-micron pixels) and a 2-megapixel secondary sensor, with support for 4-in-1 Super Pixel, AI Face Unlock, and AI Portrait Selfie (with real-time potrait preview), AI Beautify, as well as AI Scene Detection. Connectivity options on the Redmi Note 6 Pro include 4G VoLTE, Wi-Fi, Bluetooth v5.0, GPS, a Micro-USB port, and a 3.5mm headphone jack. Sensors onboard the Redmi Note 6 Pro include accelerometer, ambient light sensor, electronic compass, gyroscope, IR blaster, proximity sensor, and a rear-mounted fingerprint sensor. There is a 4,000mAh battery under the hood, with support for Qualcomm Quick Charge 3.0. However, the bundled charger supports only up to 10W charging. Dimensions of the smartphone are 157.91×76.38×8.26mm and weight is 182 grams.